One of the striking facts about Argentina is the geographical and cultural diversity the country offers. You can experience the Andes, Tierra del Fuego, Patagonia, the Pampas and the beaches. Visiting the villages in the mountains, the football stadiums or simply enjoying the big city night you will hang out with a culturally mixed population of European immigrants and native people. 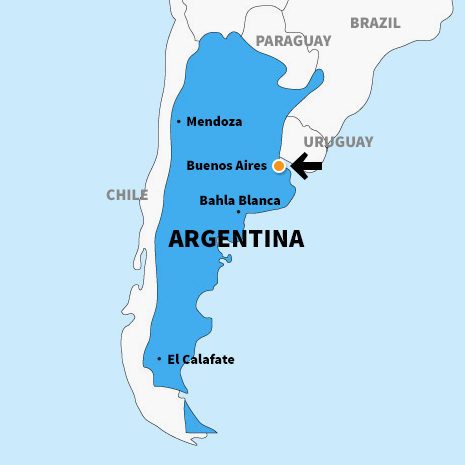 The Capital Buenos Aires is a large, diversified, passionate and energetic port stretching along the Rio de la Plata. Talkative Porteños, as the residents are called, have a rich and diversified cultural identity, and the city is an interesting blend of styles. Tango bars, antique shops, bohemian neighborhoods, street markets and “beef” restaurants are some of the treasures you can find in the city. The majority of the lectures will be held at Universidad Nacional de San Martin's campus in the centre of Buenos Aires, close to el Congreso. The programme fee includes accommodation, and students live in apartments and guest houses in the center of Buenos Aires. Two to four people share a room and the standard is rustic and charming. Single rooms are available. You are also free to organize your own accommodation and get a deduction in the fee. Food is not included in the programme fee, but you will have access to a kitchen and the city offers a wide variety of cafes and restaurants. Many students take the opportunity to explore the region before and after the study period. The studies and life in Buenos Aires will be the natural focus during the semester, but there will be opportunities for short weekend trips. Our collection of travel stories from previous students might awake the explorer in you. It is possible to spend a week in the countryside the week before classes begin in Buenos Aires. Read about this "Quinta Escencia-Experince"
During the weekend, Argentinians flock to the parks to enjoy their mate tea in the sun. In the homes and the traditional parrilla restaurants, the abundant barbeques, the Italian ice cream and the Malbec wine offer refreshing breaks from the city´s unkind beauty ideals. Learn more about the culture in Buenos Aires. As you know - when it is spring in Europe it is autumn in Argentina. Otherwise, the climate in Buenos Aires is similar to that in the South of Spain. During the autumn semester (their spring) it is a bit cold the first weeks and then it gets very nice. During the spring semester (their autumn) it is very hot in February and then March and April are the best months of the year. The below link will illustrate average temperature and precipitation throughout the year. You book your own flight tickets. Our travel agent Kilroy travels offer both joint arrivals with fellow students and individual travel. With Kulturstudier you can study in Argentina, with transferable credits, which will qualify for financing from many European state educational loan funds. In addition to the programme fee (that includes accommodation) you will need at least 3000 Euro for travel, books, pocket money and other expenses.